Reality Shock Records is a Uk based Record Label, and one to watch out for. The Stir It Up Riddim is the first release and is due early March in 7″ format. 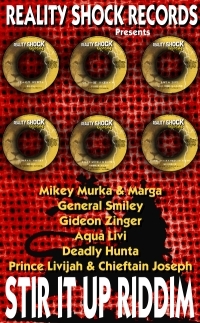 Gideon Zinger,General Smiley, Deadly Hunta, Aqua Livi, Prince Livijah and Chieftain Joseph.